The second one is part of Tori's back to school feature on her blog, Fashion Trends & More. You can check out how some other high school bloggers, as well as myself, styled our ideal first day of school looks here! Thank you, Tori! Choosing my first day outfit has always been a ritual. I try endless pairings of tops, skirts, dresses, jackets, shoes, etc until I find the absolute perfect outfit. Some people may say, why dress up on the first day? Why even bother? Well, think of it this way. You haven't seen most of these people in a few months. It's like meeting someone all over again--and you have to make a good impression! Here are my go-to tips for a comfortable, chic, and unforgettable back to school outfit! 1. Highlight your best features. Maybe you're tan from the summer? Or you just got an awesome manicure? Or maybe you have great hair? Whatever it is, make sure it stands out. I'm much tanner than I was at the end of the school year, so this outfit was strategically picked to highlight that! White is a great color to show off a tan and make you look even tanner than you are. 2. Make sure it's comfortable. You don't want a million things going on, even if it's cute. Layering is awesome and all for winter, but when it's still technically summer, you want to stay cool! Throw on a light jean jacket or cotton blazer over a dress. Don't wear pants, unless your school is air-conditioned (mine isn't...gross). You're going to be in the outfit from 8 in the morning to 3 in the afternoon, so make sure that by lunchtime you're still feeling and looking great! 3. Be bold, but not over the top. Like I said, you don't want a million things going on--but not just because it's uncomfortable! You don't want to look like you tried to hard. Make your look effortless with stacked bracelets on one arm and a pretty necklace, but don't go crazy with every kind of jewelry you can imagine. Above all, make sure that you love what you're wearing! I feel my best in a pretty mini dress. This number scored on clearance at Forever 21 does the trick for me! I also love to show off my painted toes, so sandals rather than flats are my shoe of choice for the first day. Whatever yours may be, as long as you're confident you're sure to look great! I am agree with those 3 points, and you look so pretty. I have been following in chictopia for awhile, now I am your follower GFC, bloglovin, everywhere! hope you follow me back if you like! I love your stylish look! i love your outfits, rory <3 they are wonderful! Lovely! The dress is beautiful! Love that fun dress and the way you styled it! Congrats on the features! That's awesome!! Such a cute look Rory! Congrats on your features!! Loving your jacket and sandals! Haha, you have some great tips! Totally agree with everything. Especially the "bold, but not over the top". Anyway, LOVE this dress from Forever 21! Its so cute - such a bold floral print. Such a fun outfit! 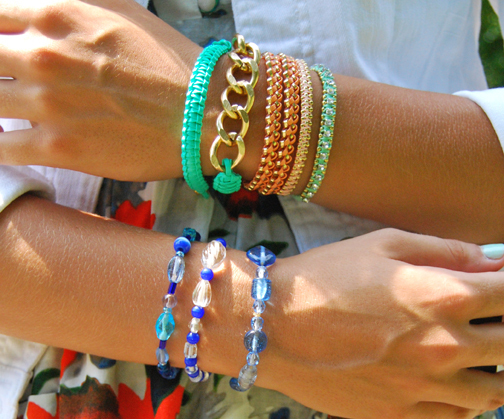 I looove your bracelets! I just love the print! Very bold and quite the eye-catcher!